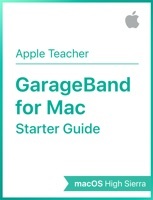 GarageBand for Mac Starter Guide is a beginner’s guide to playing and recording great-sounding music and audio compositions entirely on Mac. It will walk you through step-by-step instructions for creating a narrative soundscape as you learn to use the elements and features of GarageBand in a hands-on exercise. All of the materials you’ll need are provided. As you build essential skills, you’ll be inspired to create your own musical arrangements.